Zoomylicious: Umm...it's all my fault. Tonight: Rain showers before 2am, then rain and snow showers likely. Low around 33. Breezy, with a north northeast wind 15 to 18 mph increasing to between 23 and 26 mph. Winds could gust as high as 37 mph. Chance of precipitation is 80%. New snow accumulation of less than a half inch possible. Thursday: Rain and snow likely, becoming all snow after 8am. Cloudy, with a high near 35. Breezy, with a north wind between 22 and 24 mph, with gusts as high as 33 mph. Chance of precipitation is 60%. New snow accumulation of around 1 inch. Thursday Night: A 30 percent chance of snow showers, mainly before 8pm. Mostly cloudy, with a low around 32. North northwest wind between 16 and 18 mph, with gusts as high as 26 mph. Yeah...so yesterday I hit the nearby garden center and purchased 3 Ostrich Ferns and 4 Pulmonaria (Lungwort) plants. Mind you, this is not the first time I have purchased plants and had Spring turn back to Winter within a day or two of my purchase--far from it. I actually think this year may be the first that I've jumped the gun this severely. Most recent years I have tried to wait until May to buy things for planting, but this Spring has been so unseasonably warm and sunny that some stupid part of my brain had me convinced that I'd be "safe." Ha...joke's on me! Luckily I have not yet planted my purchases, so they will be going into the garage for a few days--until this Winter relapse passes. Once it's safe to plant, the ferns will go near our front door, behind some hostas. We had previously had some Azaleas and Rhododendron there, but there wasn't enough light and after a few years they languished and eventually gave up the ghost entirely. Depending upon how much they spread we may add a couple more to fill in, or perhaps a couple more bleeding hearts, since they also seem to do well in our yard. 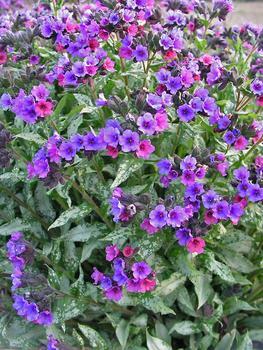 In-between our existing 5 bleeding hearts I planted the Pulmonaria. They should have pretty foliage long after the Bleeding Hearts die-back in mid-summer. The garden center was still nowhere near fully-stocked, so in a week or two I am planning to go back for Spotted Dead Nettle ground cover to fill in other empty areas. They have a new yellow one that I'm looking forward to planting. Most of the color in our yard is pink, lavender, or white. In other "growing" news, we finally have some Triops hatching in Dane's latest Science project for his Life Science unit. The first batch didn't hatch, which we surmised to be an issue of too-much-tank (they were in a 1 gallon aquarium). We tried the second half of the eggs in the tiny tank that came with the kit and all is well. Once they are bigger I will likely switch them to the larger tank, again.